Kinesiology Tape has become a go-to adhesive tape for athletes, people constantly on-the-go or simply have bouts of pain in certain areas of the body. BSN Medical Leukotape K is the newest kinesiology tape available that will help stimulate sensory function, promote circulation through the body and make sure full mobility is maintained. The Leukotape K is able to stimulate those functions by providing and allowing air to circulate throughout the body. This circulation keeps the muscles from being over-stimulated, preventing tightness and muscle cramps. Full mobility is maintained thanks to this proper air flow, preserving energy throughout the area where it's placed. The tape is also comfortable, durable, easy to remove and can be used for nearly any activity. The Leukotape is stretchable, making it much easier to work with the elasticity of the body. A protective liner for better protection of the adhesive side offers extended durability. The cotton-like backing material is skin-friendly. Each application can last up to one week, is easy to remove and can be worn while showering or doing any kind of physical activity. 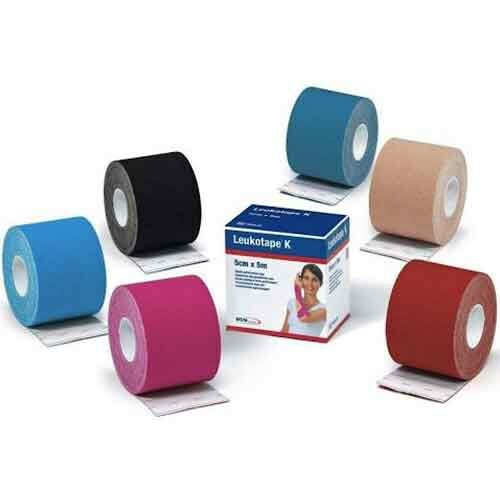 Leukotape K comes in six colors and three different widths.